*Owners of dogs impersonating genuine service animals may be subject to fines, jail time and/or confiscation of said animal. Posted On 07/11/17 by Shauna T from Bozeman, MT Yes, Shauna T recommends this product! Perfect, works great with vest i also purchased! Posted On 04/25/17 by Paige B from Jackson, MS Yes, Paige B recommends this product! Posted On 12/12/15 by FurKid Mom from PDX, OR Yes, FurKid Mom recommends this product! 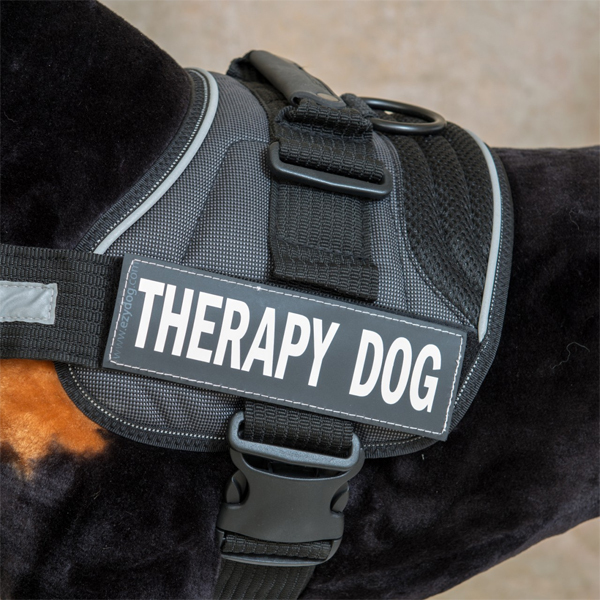 For the legitimate, certified therapy animal, these are helpful not only for the working harness, but for gear. I am using these to label a soft carryall that I keep my therapy dog's working gear in. I absolutely DO NOT condone the use of these patches (service/search and rescue, therapy, etc.) by folks masquerading their pets as working dogs. Posted On 12/07/14 by Donna L from Greenfield, WI Yes, Donna L recommends this product! I love the side patch - really noticeable that my dog is a Therapy Dog. I think the website is awesome, and has some of the best accessories for dogs I have seen!